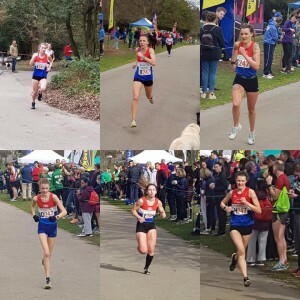 Saturday 23rd March saw our Senior Women’s team of Rebecca Twardochleb, Kerry Marchant, Leah Whiston, Lauren Charlton, Lucy Matthews and Sophie Goodfellow take on the very best athletes from across the Midlands at the Area 6 Stage Road Relays, held at Sutton Park. Our team produced what is believed to be the best women’s performance ever achieved by the club at this event finishing just outside the medals in 4th position. Leg 1 and 3 were long legs (5.38 Miles) and Legs 2,4-6 were short legs (3.16 Miles). Becky was on the first leg and ran a time of 32.57 to come back in 9th position, next out was Kerry who ran a time of 19.23 to move the team up to 7th. On the third leg, Leah maintained our 7th place running 34.52, Lauren ran a time of 20.15 to hand over in 8th position to Lucy. Lucy ran a 20.25 leg to move the team up to 5th position before handing over to Sophie, who ran a final leg of 19.24 to bring the team home in 4th. Our 13/15/17 athletes also took part in the 5km Championships held earlier in the day and the report on their huge total of 14 Midlands Medals can be found HERE. Congratulations to our Senior Women’s Team – a great performance, and a really promising sign of the strength in depth we now have at the club.